As a Junior (skills, not age) Olympian Knitter, I'm probably the alternate knitter on the Team in case one you Michele Kwan level knitters gets whacked in the elbow or something. But I'm making my second ever sweater so I'm super excited and have my skeins wound and ready for the road to TV-Torino ! I'm making the Abigail sweater from KnitPicks in Twilight blue. I've decided to do Cozy for the Olympics. I ordered a LOVELY blue silk yarn to make it in, it should be here by Friday. (I also bought yarn for Clapotis today, but that I'm trying to have done by the end of March, but with others of you making that now, I'm tempted to switch...I'll see which yarn calls to me more when they arrive. ) GO TEAM!!! Don't let the Knitting Bus leave without me! I've decided to toss my current WIPs to the side and join Team Knittyboard for the Knitting Olympics. If my new Addis get here in time, I'm going to try knitting two socks at once, toe up, on two circs. Keyword = try. If my needles don't get here in time, then I'm doing Branching Out with the lovely E.L. Silky Wool I got from my last Knitty SP, darbyrose. Thank goodness we can swatch before the Olympics begin. Last night I tried out the cable pattern I thought would look so cool on my vest and now I think it looks...horrid. It's just too bulky in a worsted weight yarn. It would be much nicer in sport or DK. So...I think next I'll give the Kepler cable pattern a go, plus a seed stitch design (no cables) from one of my stitch dictionaries. That one would lay flat, which might be more to my liking. I want interest up the front of the vest, but not something that says, look at the big chunky cable! help me with my gauge! i promise a scan of magazine pattern pic and yarn soon, but i'm headed off to school. y'all can help me while i'm there. i just started swatching for my Olympic Knitting. Sweater #13 in Winter VK, twisted rib body with cabled yoke. Using Araucania NatureWool colour #46.
so i picked out size 7 needles, cast on 19 sts, and did 20 rows of twisted rib. my swatch is 4 inches wide, but only three inches tall. so. i am not so worried about that, as ribbed section is by measured length, and not a specific number of rows. Now i have to swatch for the cabling part, where obviously row gauge matters a bit more. Pattern says 24 sts/22 rows over 4 inches, using 6-st cable repeat. So....what size needle do i use? Stay with the 7? Attempt it with an 8? because cabling creates tighter fabric.... can i fudge stuff around (has raglan decreases, knit in four pieces) to make it work? I really want this to fit!! The cables start at 14 inches from bottom of front/back, about boobal area in the piccie, and you do 6 rows before binding off at underarm and beginning decreases. That, that is The Olympic Yarn. To be made into the Olympic Wrap. 8 incredibly squishy hanks of hand spun hand dyed merino from Happy Wool over in The Holyland. The event: to transform those 8 hanks into a wrap worthy of the yarn, the boards and my time. Previous training include several wraps and mosaic stitch bags in preparation for the big event. Winding, designing, knitting will all be done in the allotted time. Anybody else designing their own thing for the Olympics? For the love of Maude! I chose Kiri (links to PDF file, fyi) and ordered KSH in Heavenly. So. I'm nuts. I need to get myself over to the KnittyBoard to ask a question about lace charts and repeats. The Harlot did say to make it challenging, right? I think I've picked something plenty challenging for me. It will be an Olympic Miracle if I finish this baby. I'm going into training mode soon. I think my training mode will consist of positive thinking, faithfulness to only Kiri (I will not even look at, or think of, another project), quadrupling my caffeine intake and making sure my kids have a wide selection of new and exciting DVD's to keep them quiet. That's right, Donna, a teammate will be joining you in the Olympic quest to complete the elusive, enigmatic Clapotis. OK, elusive and enigmatic for me and Donna. No need for the hyperlink, you all know where to find it. Go Knittyheads!!!!! I will be using No No Kitty's Monty Wool in the colourway, Snow Day. Again, no link since Danielle is retired. Rest up, my knitting sisters. We're gonna rock the Games! Oh No! Not Another Clapotis!?! Yes, I will be knitting Clapotis for the Olympics. I've held out on making this, but now is the time to join the ranks of the million others who've knitted Clapotis. It was on my "Things to Knit" list for 2006 anyway. I am using Mountain Colors 4/8 wool yarn. I picked it up at my LYS's annual January clearance sale. If you go to my January blog archive and scroll down to the January 7th post, you'll find a photo of the yarn. So this is what it's like to be an athlete. Zib - I love it! I'll be making Hush Hush from KnitPicks Shimmer in Flower Garden. I'm a little afraid of the fine gauge stockinette for miles - it's going to be tough for me to focus, but I love this pattern and have wanted to make it for a while now. Can't wait to cast on! checking in - FBS for me too! Flower basket shawl for me as well! I'm making mine in a hand dyed red yarn (dye your own from knitpicks). I can't wait to get started! Just checking in... I will be making my first pair of socks - Wendy's Toe Up. I am making them out of home-dyed KnitPicks, on size 2's. Works out perfect for the pattern, because we all know how I *love* to make guage changes... NOT! I'm going to do my best to finish by the 26th, when he comes to shear our sheep. I am going to make Branching Out in Pewter Peruvian Collection Baby Cashmere - This should be fun and exciting - my first lace project! I'm planning to knit one of cabled jumpers from the Fall Vogue Knitting, though I'll be doing it in green (Rowan Big Wool) with gold hem and cuffs (Rowan Kidsilk Haze). Must teach myself to cable this weekend! Lacey! I have the yarn. I have the needles. (I'll try for the stamina......) It will be done!! No, I'm not being paranoid, that's the name of my cardigan. I'm designing it myself and am aiming for something other than the shapeless potato sacks I usually knit. It only exists as a drawing on the back of an envelope at the moment, but should be a fitted raglan cardigan, with a shawl collar. It will be long length (roughly mid-thigh) with curved fronts. I'm making it in Patons Fairytale 4ply in Olive Green. It's the same stuff I used for my Baby Flying Suit and I have about 850g to play with. I haven't made an adult sized item for a few years so expect tantrums and tears. I will be making I Do in an attempt to improve my lace-knitting skills. I will be making it out of some handspun alpaca that I bought at a quilt show last year. I would like to state ahead of time that I may be shortening the sleeves a little bit, but this is in no way an attempt to cheat in order to finish the project within the time frame (believe me, as busy as I am, this will be a challenge, even with shorter sleeves). It's just that I'm worried that I might not have enough yarn, and I really want to use this yarn. Cable and Rib Toddler Sweater with Hood! 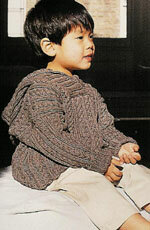 I'm planning on making Debbie Bliss' "Cable and Rib Sweater with Hood" from The Baby Knits Book for my 2 year old (toddler sized) in Knit Picks' Merino Style, dusk colorway. Yarn is on the way, I already have the book... now I just need to gear up and wait for the Opening Ceremonies! I'm really excited about this project, and would never have considered it without the knittyboard thread. Feb 10th seems soooo far off! a vest! Designed by moi. With a compound cable running up the front. In Knit Picks Wool of the Andes in pumpkin. Seeing as I've never finished anything in 16 days (aside from dishcloths and hats), this will definitely be a challenge. I'm so glad it's OK to swatch beforehand, because I really need to test out the cable pattern and make sure I like it. Hi everyone!!! Well I am going to make chocolate...hehehe! If one of the above 3 are chosen....chocolate yarn in varying shades of Lambs Pride Worsted will be used. I haven't decided what I'm going to knit yet. It's either going to be the Ticker Tape Western Jacket, for which I have the pattern but not the yarn, or Jaywalker Socks, for which I have the yarn but not the needles. Or maybe something out of this book. We'll see. All right - Time for practice! Roll Call! Please post (in the blog, not the comments) what you are making! Include links to the pattern source and your yarn choice if you can!